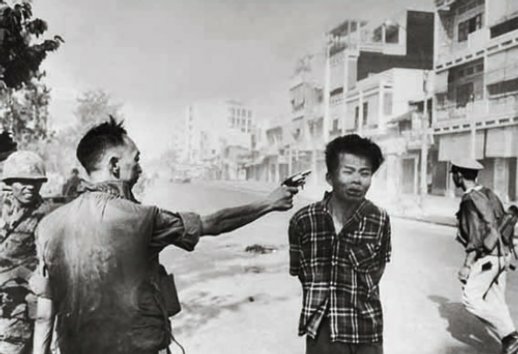 Eddie Adams, fotógrafo de guerra da Associated Press, obteve esta foto em 1 de Fevereiro de 1968 nas ruas de Saigão. Com ela ganhou um Pulitzer Prize. A imagem mostra o assassinato a sangue frio de um guerrilheiro vietcong, presumivelmente o oficial vietcong Nguyen Van Lém, pelo chefe da polícia de Saigão, o General Nguyen Ngoc Loan. "The general killed the Viet Cong; I killed the general with my camera. Still photographs are the most powerful weapon in the world. People believe them, but photographs do lie, even without manipulation. They are only half-truths...What the photograph didn't say was, 'What would you do if you were the general at that time and place on that hot day, and you caught the so-called bad guy after he blew away one, two or three American soldiers?" Para a história fica o ícone em que esta imagem se transformou e o contributo que deu para incendiar a opinião pública americana e mundial e acelerar o fim da Guerra do Vietname.